All businesses and organisations have to maintain fire safety logbooks to record their regular equipment tests and findings. Just to give one example, fire extinguishers have to be visually inspected on a monthly base, serviced yearly and refilled usually after five years (except, of course, the service free P50 fire extinguishers). Fire alarms have to be tested and serviced as well and the list of fire safety equipment requiring regular servicing just goes on and on. Most inspections will be on different dates, so keeping track of your compliance can be a real challenge. If your company is spread over multiple sites, the challenge becomes even more daunting. Multiple members of staff will be involved in the compliance checking and will have to report their data to a central office. Safelincs has developed a FREE online multi-user fire safety logbook which not only allows the recording of maintenance across multiple sites but also manages a reminder system for all people involved. The system supports the Responsible Person in the central office with an insight into the overall fire safety recording status. The fire safety logbook will hold all the data for you, however, a backup copy can be printed out at any time. And best of all – this service is entirely free! To use this online fire safety logbook visit our website. Planning your emergency lighting can be quite daunting and appear very complicated. We have developed an emergency lighting guide to help with all the issues of planning where to install your emergency lights. The guide has been developed through answering customer questions on emergency lighting installation, ensuring that we are answering the questions you want to ask. The guide covers topics such as planning, location, types of lights, signs and testing your emergency lights. The emergency lighting planning section goes through six steps to ensure that you comply to the most update legislation, including the Health & Safety (Safety Signs and Signals) Regulations 1996, and the Regulatory Reform (Fire Safety) Order 2005. The guide is designed to help proprietors or people responsible for emergency lighting provisions to think about the many aspects of evacuation and escape. The section on where to locate your emergency lighting covers every day areas such as corridors and junctions, where there may be a change in direction to stairways, steps and ramps as well as exits and fire and first aid points. There is also a section for areas that are not so common, covering large open areas, generators or heavy machinery, escalators and lifts. Each of the sections gives a comprehensive guide to which compliant emergency light is available, giving you the overview and possibility to choose the correct lighting not only for location but also in accordance with your budget. Emergency lighting is only one section of this guide. The guide also covers the installation of safety signs, again giving advice in accordance with the Health & Safety (Safety Signs and Signals) Regulations 1996, and the Regulatory Reform (Fire Safety) Order 2005. It covers the requirement of externally illuminated signs or internally illuminated fire exit signs. Once the type of emergency lighting has been selected and the correct emergency exit or fire exit signs have been purchased it is critical to have some knowledge of the testing requirements as set down in the British Standard BS 5266-1:1999. The emergency lighting guide looks at monthly testing, half yearly testing and testing of appliances that are three years old. It is the role of the designated responsible person to ensure that the emergency lighting, once it is installed, is working according to the legislation. When purchasing emergency lighting from Safelincs you can choose to register for a reminder at the end of the checkout process and we will automatically send you reminders to test your emergency lighting when the lighting is coming up for testing. For recording your emergency lighting tests you can also download our free fire safety logbook. Safelincs is aware that in the current economical times, the purchasing of fire alarm tests records, emergency lighting test logbooks etc, is not at the top of the list. That is why we have made a FREE downloadable log book. The Logbook includes fire safety advice in fire prevention, fire escape, fire alarms, fire extinguishers, emergency lighting and general fire precautions. 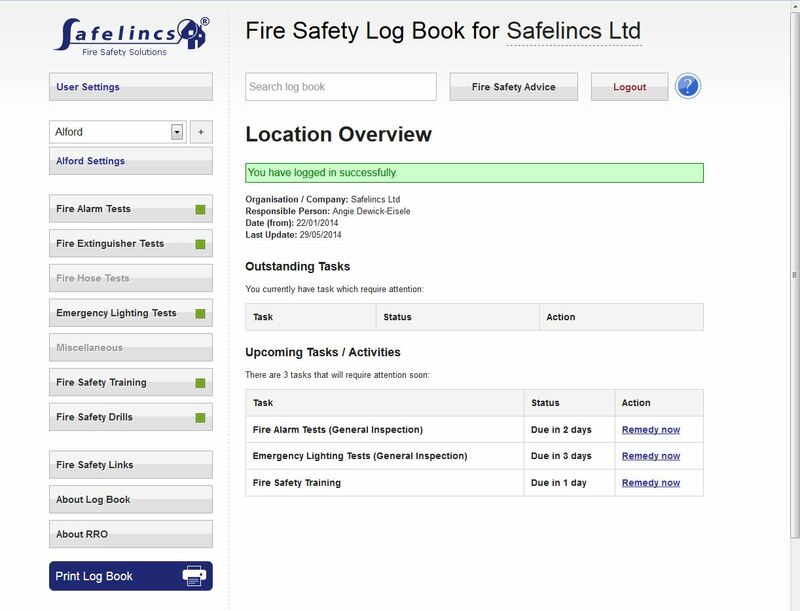 Visit www.safelincs.co.uk/fire-safety-logbook to take advantage now!